Chef Stéphane Jego and the fine art of bistronomy. At 7:30 on a Friday night, Chef Stéphane Jego stands at the pass like he’s been there for hours – like maybe he’s been there since time immemorial. It’s the beginning of service at Paris neo-bistro L’Ami Jean, and half of the tables in the dining room sit empty. Still, he expedites plates with his signature speed and intensity, sprinkling sea salt over a thick slice of terrine before he nods at a server, who whisks it away. Jego examines every dish. He hunches his shoulders and leans down low until his face hovers inches above plates, and he wipes down the edges. He garnishes, nudges, and tweaks. He holds a copper saucepan in one hand and ladles sauces on top of sweetbreads, braised veal cheeks and duck legs with the other. He grates cocoa over a cut of meat with a microplane. If a bistro in Paris is meat and potatoes, L’Ami Jean is expertly cooked meat (whether seared or braised for seven hours, as the veal cheek is) and potatoes pureed into silk. Bistronomy, as Jego defines it, is simply to serve the best products in a format affordable to everyone, a concept often credited to Le Comptoir chef Yves Camdeborde. Jego trained under Camdeborde at Paris’s celebrated La Régalade, where the philosophy helped him find his rhythm and calling. “[Bistros] should no longer be compared to or opposed to gastronomy; we are part of it, but in a different way than star-rated restaurants,” he says. Bistronomic restaurants mean that haute cuisine needs no longer be an inherently elitist concept. He’s right: nothing about L’Ami Jean says haute cuisine except the cuisine. Naked wood tables and well-loved bistro chairs dot the dining room, along with two server stations holding bread baskets and tacked-up tickets. The mural on the walls stands as a relic from the days pre-Stéphane Jego, when L’Ami Jean was a Basque rugby pub. Servers clad in jeans and T-shirts hurry from station to table, bumping into each other, calling new dishes over their shoulders to the pass from every point in the restaurant. The sounds of steam and smoke are more than ambient noise: they’re an orchestra, and it’s loud. For the past 15 years, cooks at L’Ami Jean worked in a tiny kitchen with a few burners and a grill. This summer, Jego closed the restaurant for a month of renovations, built out an eight-burner stovetop, a dedicated pastry station, a new pantry, and a corner for to-go orders. New walls and more mirrors brighten the space. “When you enter, you get the impression that nothing has changed, but that it is bigger, clearer,” he says. In this configuration, Jego is the centerpiece of both the kitchen and the dining room, the two almost indistinct thanks to that narrow pass, a tiny isthmus servers slink through to grab platters and check in with cooks. His body is almost a permanent fixture of the pass, like a person standing at a drive-thru window, never leaving his post. Instead, his baritone fills the room as he barks orders to the host in a back-and-forth exchange, somewhere between banter and command. (They don’t look scared, but they oblige – quickly.) Jego is the restaurant, both philosophically and physically: L’Ami Jean never opens without him. Even as he began the remodel, Stéphane aimed to preserve the character and history of the original space. He dismisses sleek or modern design, and a reopening announcement on the restaurant’s website makes an ironclad promise: The essential thing remains the same, it reads. The chef is always there, in front of his customers, in the middle of his brigade. Tonight, Jego claps his hands when plates are ready, and he yells—a lot. C’est très chaud! Terrine pour Monsieur! Allez, allez, allez, go, go, go! As the minutes and hours pass and the dining room swells, his voice grows loud and gruff. He doesn’t interact much with guests, save the table sitting (enviably?) just beside the pass. It can be tempting to think he’s oblivious to what’s happening in the dining room, but in fact, the opposite is true: That low gaze through his heavy-rimmed glasses keeps constant tabs on each guest. He is the conductor of every experience. For me, it’s a bit like a performance,” he continues. “If I see that the atmosphere is a little weak, then I act. Clients must have a good time; they are not there only to eat. It is up to me to look after all these details.” It’s that care and concern that informs the many pauses he takes during the night to look up at the dining room. He scans for reassurance – that the food satisfies, that everyone is having a good time. For all the pageantry, there is vulnerability, and all the while, a crowd of new guests huddles by the door, waiting for their turn. He’s reconfigured the tasting menu and introduced family-style dishes to shake up the starter-main-dessert routine. As the chef changes, so does the experience, but his philosophy still stands on two pillars: pleasure and sharing. Servers urge every table to try the rice pudding, and their confidence is founded: stirred with salted caramel whipped cream and caramelized pecans, scooped with a wooden spoon from a heaping mother bowl, it’s a crunchy-creamy cherry on top to the rib-sticking main courses. At one point in the night, all of the lights shut off, and the kitchen goes black. Maybe someone blew a fuse; maybe it’s something else. Both the front and back of the house are still, waiting to see if Jego will blow, too, but he is quiet until the lights flicker back on just a few moments later. And then, he’s back on with them: the barks and claps recommence. 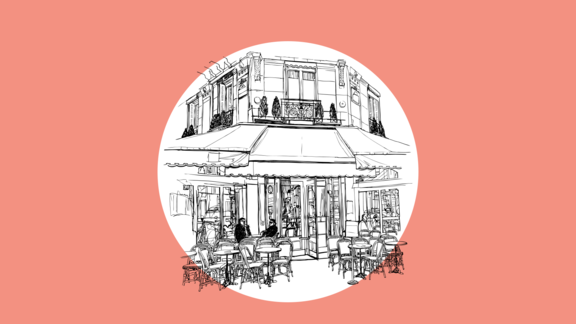 Tracking the color-drenched design and fresh culinary vision of Big Mamma Group through the arrondissements of Paris.